Ping-Pong tables, skate ramps and a vintage Airstream? It's just another day at this Ravenswood office. Walk into the office of skinnyCorp (parent company of Threadless, the überpopular, locally based T-shirt-design website and retail shop) and you’ll most likely recognize a few familiar faces. Many of the company’s 65 employees appear on threadless.com, modeling the store’s graphic tees. But it’s not all photo shoots and office busywork in this 25,000-square foot Ravenswood warehouse space. There’s plenty of fun on each day’s agenda, too. It’s easy to confuse the office’s entrance for some sort of video-game arcade. Lining the wall are an old-school photo booth, classic video games such as Killerspin, and a Pro Bowler pinball machine (a gift from the company’s printer). The corner of the room features a giant flat-screen TV and row of six recliners, where employees occasionally take breaks to play a little Guitar Hero. But according to Bob Nanna, promotions manager, most of the workers’ downtime is spent at the two Ping-Pong tables near the receptionist’s desk. “We have a rabid core of players around here,” he says. The 1962 Airstream situated near the Ping-Pong tables was originally the office of community-relations manager Charlie Festa. He purchased the vehicle on eBay, picked it up in Minnesota and towed it back to Chicago with the Threadless van. “It was a 15-hour trip, but it felt even longer,” Festa says. The year spent working in the RV was a little too quiet and isolating for his taste, so Festa moved his desk to a more populated nook of the office and it’s now used as a meeting area and recording booth where videos and podcasts are created when bands such as the Hold Steady, Nada Surf and Murder by Death drop by. When it came to deciding on the decor themes for each department, Threadless rolled out the same methodology it uses on its website: a contest, but on a smaller scale. 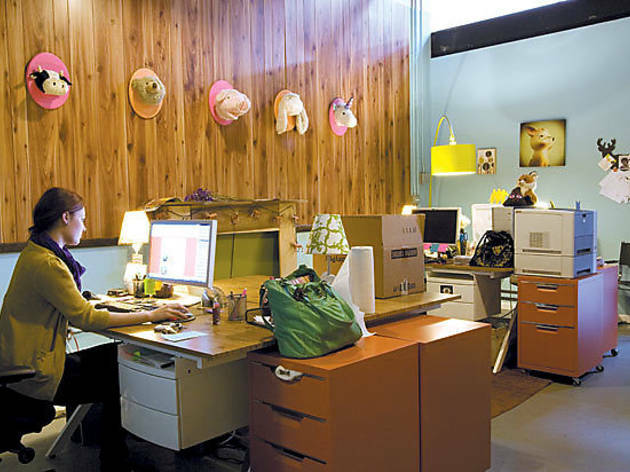 Instead of artists from all over the world submitting T-shirt designs followed by an online voting process, each Threadless department designed its own space and then the company’s founders chose their favorite. The winners were the four folks in the customer-service department, who went with the theme “crafty lodge.” Plush stuffed animal heads hang on wood-paneled walls, and the most nonthreatening bear rug we’ve ever seen (it’s basically a teddy bearskin pelt) is also incorporated in the decor. Their prize? Spa packages and, of course, bragging rights. The graffiti art throughout the office is the work of one man: Joe Suta, the in-house artist. Each week, he creates display panels to be featured in the Threadless Lakeview store (3011 N Broadway, 773-525-8640) as well as Threadless Kids (1905 W Division St, 773-698-7042) in Wicker Park. Walk into his office, in the back near the towering stacks of shirts waiting to be shipped, and the first thing you notice isn’t the many cans of spray paint or work-in-progress panels, but the huge skate ramp Suta built last summer in the room. His tiny desk sits on the middle of the ramp, and throughout the day he just moves it aside and hops on his skateboard when he needs a break. Even though the company doesn’t have any full-time positions open, it does occasionally hire temps. And starting out as a Threadless temp can possibly lead to a bigger job within the company. Take Bob Nanna, for example. He was hired as a temp, packing shirts for a holiday sale in 2005. Eventually, he was hired full time and worked his way up to his current position: promotions manager. 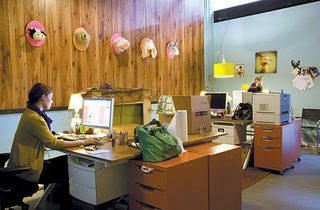 Nanna says the company usually finds temps and part-time staffers via Craigslist and the Threadless MySpace page. So, be on the lookout for opportunities.